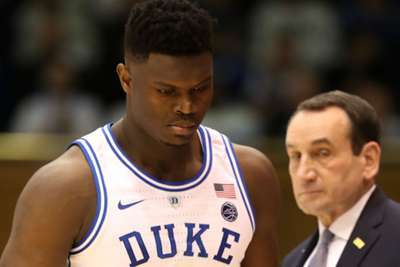 Zion Williamson returned from injury due to his "love" for his Duke team-mates. Williamson missed five games with a mild knee sprain, which he initially suffered within the first 40 seconds of the Blue Devils' game against North Carolina on February 20. Many believe the 18-year-old forward should have sat out the remainder of the season and prepared for the NBA draft but Williamson was eager to get back on the court. Explaining why, he told ESPN: "I love my team-mates and I made a commitment to them when I committed to Duke. "I felt like I would've been a bad person if I didn't come back so coming back was not an issue." Speaking ahead of his March Madness debut on Friday, he added: "When players get hurt it forces you to respond in a different way and just makes us closer as a team because we've been through so much and the fact that we're here now, it's a brotherhood. "We just bonded through it all."